Ploy’s last puzzle was less than a year ago and had Big Ben as its theme. Drawing the bell through all the necessary squares and no others caused me problems, not only in the solution I sent to JEG, but also in the animation that accompanied my blog. I hoped this week’s puzzle wouldn’t cause me similar problems. Here we had a Right and Left puzzle with a grid that was interesting, not least because it had a great big gap gouged out of its centre. Ten of the nineteen double clues had a word that needing moving before the clue could be solved, their initial letters spelling out what the central space was and a comedy duo. There was no point in starting with the top row, since that was given by synonyms of extra words in three clues, (4,3,4). 1, 2 and 3 down would hopefully make two of those words obvious. 1dn-2 was a simple anagram of ‘use love’, EVOLUES, and I slotted it into the left side of the grid. Next came 2dn-2 IDEATE, and a quick scan of the intersecting across clues gave me 7ac-1 SMETANA. Unfortunately, I now had only one letter on each side of the top row, so I decided to try the four 10-letter entries. I only got SANITISERS and put that down the right side of the grid. The anagram of GIANT DRAIN would have to wait. UNRENT, SPY, SEMINAL and IOTA all went neatly into the left. Most of the left was completed in about forty minutes, but it looked as though I had the sides the wrong way round since the top row began EG•E and it was more likely to be EDGE. It was interesting that having just one or two letters in an entry enabled me to focus on the appropriate half of the clue leading to it. Even so, the remainder of the grid took me much longer than I had anticipated. Even if I could see the answer, some of the clues needed careful analysing to be sure there weren’t any hidden surprises. For example, 10ac Ignore dying interest in people without a will – properties for some of those flogged for a single purpose (7) led to ESTATES and ONESHOT, the latter wordplay being ON + THOSE* where ON was a dialect word for ‘of’. Also, 8ac Estimates veteran cars bringing in money from Asia: not just one, by the sound of it, a hundred (6) had ‘not just’ as the definition for WANTON. In the top row, I had WIND (defined by ‘burp’) and EDGE (‘border’). At first I thought that the third extra word was the ‘Figure’ from 1ac which might give WIND ONE EDGE, but I finally managed to put that with ‘square dance’ to define DOS-A-DOS. That left ‘wiseacre’, but no 3-letter word came to mind. This is the beginning of a song entitled Misalliance which Ploy obligingly wove into the clue to 7ac, although I suspect that didn’t help anybody. When I came across the window-ledge, OWL was the final piece of the jigsaw, defined by ‘wiseacre’ and was slotted into the middle of the top row. Thanks for a very enjoyable puzzle, Ploy. Drawing the two plants climbing up the grid turned out to be a bit tricky, but significantly easier than Big Ben from last time, so extra thanks for that. I’ve recently been encouraged by shirleycurran to post some of my (what she calls ‘quirkier’) Listener solving experiences here – so here goes! As an aside I’ve been solving cryptics since a teenager and am beginning now to get some puzzles published under my pseudonym Encota. I’ve loved attempting to solve The Listener for some time but only started sending them in after a fortuitous meeting with Roger, one of the Editors, last December. What an intriguing and innovative puzzle – thanks Ploy! Putting the first pairs of answers in I was lucky to guess right (or was it left?). Spotting which words needed moving within clues was hard in places; the three to be removed appeared fairly quickly which, combined with generous checking, meant that the WINDOW LEDGE was relatively quickly fitted into place and it felt like everything was heading towards a speedy completion. 2) Once the WINDOW LEDGE appeared, I thought about the funny Pete & Dud sketch sometimes known as ‘Film Stars’. You may recall it? The one where the semi-naked Greta Garbo is (supposedly) hanging by her fingertips from the WINDOW LEDGE outside Peter Cook’s bedroom window. Could it be this perhaps? Is this why Stars have been chosen? Looking more closely at Columns 6 & 12, the spacing in them below the WINDOW LEDGE is in the form — — – downwards, i.e. G in Morse Code. Two of them make GG, one of Greta Garbo’s nicknames! This looks very promising! However, only ten cells are being used in each column, so it can’t really be right as the Preamble says 11, even though I’d dearly like it to be, and I’m not quite sure it’s Listener material (though hopefully closer than 1!). Has Ploy included this as planned misdirection? With The Listener I am never sure!! I look forward to a Setting Blog, should one appear! 3) So the F and S appearing in the Down clues most likely does refer to those two Westminster School chaps (rather than Dawn and Jennifer, another possible planned piece of deception?). I was desperately hoping that, given the ‘dual’ nature of the puzzle, that BOTH (2) and (3) were going to be right simultaneously. However, on re-reading (and re-re-reading) the Preamble, I simply couldn’t make (2) fit as well. The ‘interrupted’ bit seems to fit the Morse Code idea as well as the spiralling, but I couldn’t successfully modify the ten moved words for this idea to work, for example. The more I look at it though, the closer it looks. Why else Stars, for example – unless simply part of 2’s deception? I’d love to hear if this was at least partly in mind when setting! Great fun – very enjoyable! Shark’s last Listener was Quads which had us turning one quadrant of the completed grid to overlay another and then filling the empty cells with all the original entries’ initial letters. Here we had no. II, and the preamble seemed to indicate a somewhat entertaining endgame. 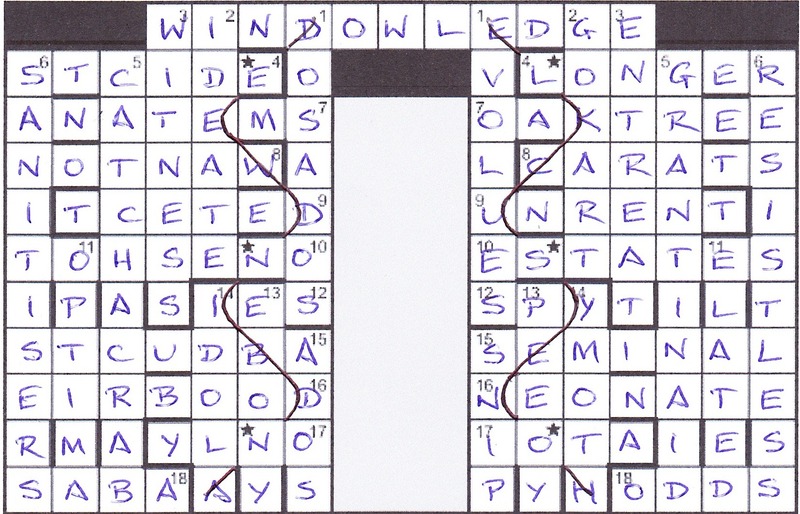 The clues, however, didn’t seem to hold too many surprises with the wordplay not indicating one of the letters of the entry. We were even told how many such letters there would be (15) but that might mean that thirty clues were affected. The only real problem seemed to be that we were faced with a carte blanche, so I decided to start my attack in the north-west quadrant. I failed with the first four acrosses, so moved on to the downs and was rewarded with 1 Fractions shift ground (6) for FIFTHS, so one F wasn’t wordplayed, but which one. Both were checked, so time would tell. In fact, only a minute later told, with 1ac Starved following drunk losing weight (6) giving FASTED (intact) and 12ac Reads about DJ’s controls (6) for FADERS (without its F). Actually it needed SEDANS at 3dn to help with FASTED (F + WASTED – W). The remainder of the NW corner was finished pretty quickly. The south-west wasn’t quite as straightforward. However, I enjoyed the clue to 24ac After knocking back fizz I’m behaving like a schoolgirl (7), even though it would be some time before it was revealed as MISSISH. I also made faltering progress with the north-east corner… oh, and the south-east as well. In the NE, I liked 11ac Flipping toffs’ mode of transport (4) for SHAY and in the SE it was 27dn Hard area of Liverpool, ultimately not so hard (6) that caused a smirk. I would probably still be struggling to understand that clue were it not for Ken Dodd, with KNOTTY ASH – AS (so) H (hard). However, no prize for guessing which was my favourite clue since you should know how my mind works by now: 18ac Wall Street office would be protective if attached to New York (4)! 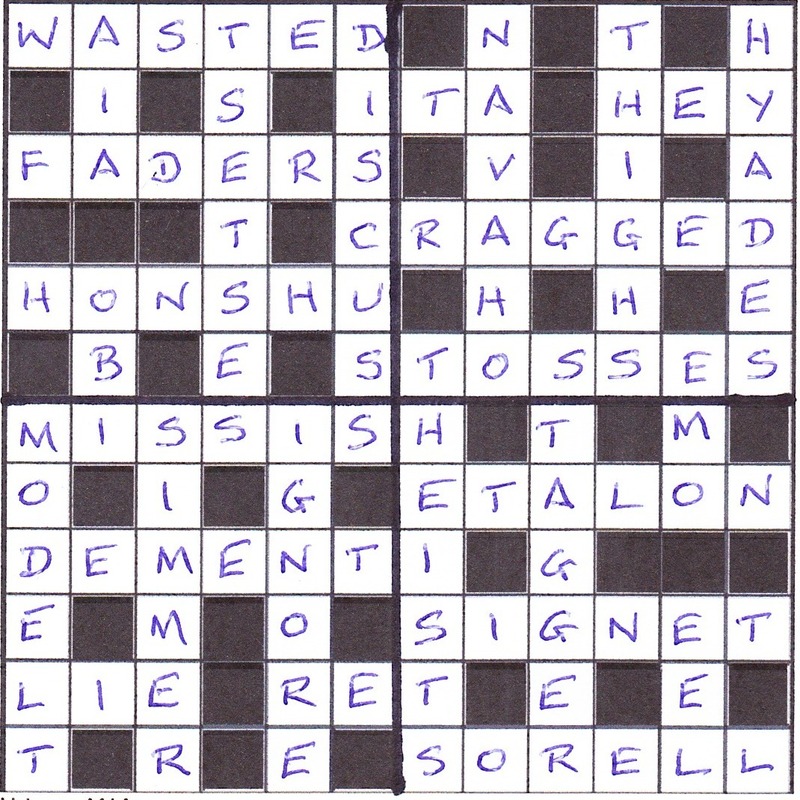 The trickiest clue was probably 32ac Upset about condition of upper storey (8) since only three letters were given by the wordplay: ATE< from DEMENTIA. There was also the reference to Harry Potter in the clue to SNITCH at 6ac — something to do with Quidditch, I think. I finished Stage 1 of the puzzle in about 2½ hours. The 15 letters not given by wordplay were FOURTH DIMENSION and I scoured the grid for DOCTOR, TARDIS, MASTER and DALEKS to no avail. Stage 2 required us to black out 40 cells, keeping the 15 letters intact and with the grid having 90-degree symmetry. 60 cells could instantly be marked as remaining, and it didn’t take too long to identify the rest, especially with words like DISCUSS and THEISTS which could be due for topping or tailing later. Stage 3 just required us to divide the grid into four pieces of the same size and shape and keeping real words. It seemed that we were given a choice for the two letter entries that would be left in rows/columns 2 and 11. ITA, EMO, RET and OBI could become IT, EM, ET and BI, except that ET wasn’t given its own entry in Chambers, only as part of a phrase. That left TA, MO, RE and OB to be left as the two-letter words. Nearly home, and Stage 4 required us to change two letters in each quadrant to reveal four thematic words. On first reading of the preamble, I had thought this might be the tricky bit, but it didn’t take me long to see that WIDTH, HEIGHT, LENGTH and TIME needed to appear inwards along the diagonals. My biggest d’oh moment was trying to work out what the hell MODELT meant! Great fun as expected from Shark, and a fascinating concept for a puzzle. I look forward to another Quads in the near future but hope that it hasn’t given Sabre an idea for Quins or Octs!